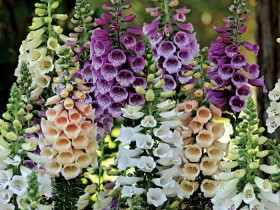 Digitalis, digitalis, reproduction, growing, care, examples of landscape design, photo and video. 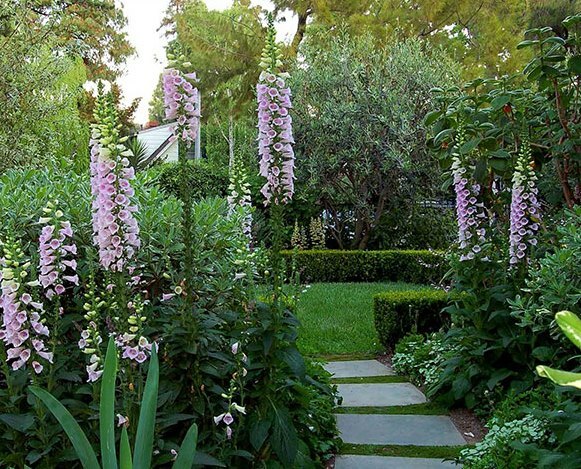 In the sun and on the shaded courtyard, among the trees and in the center of the bed looks great and feels Foxglove with large openwork bells. Proper planting and care allow you to grow flowers as tall as a human, with bright, air caps, natural decor and a real decoration for any garden or suburban area. 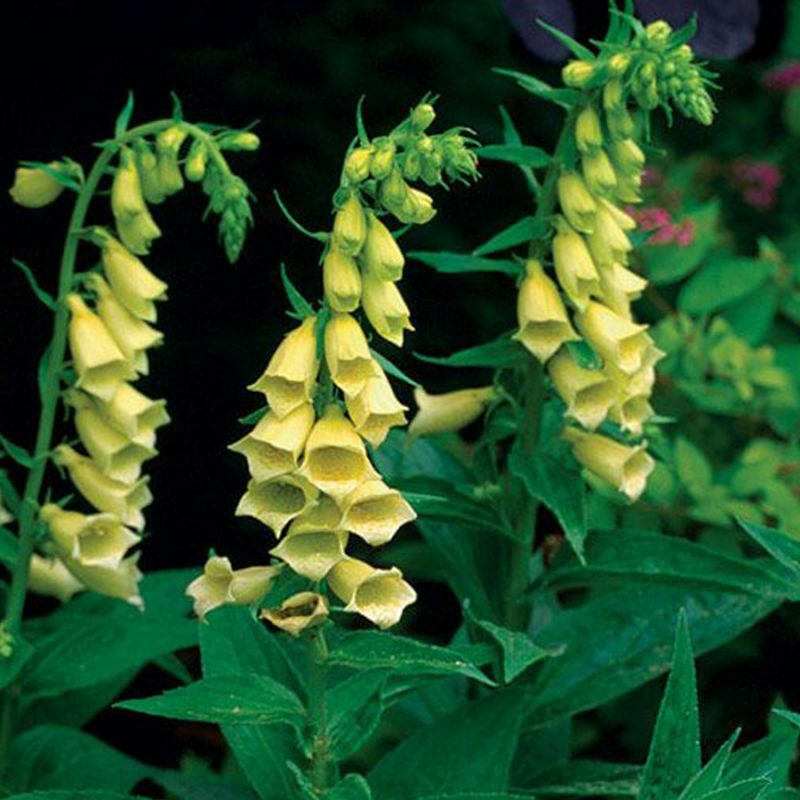 The name speaks for itself – it comes from "thimble", Latin – digitalis (digitus – "finger"). The genus includes more than thirty types, they grow in a large area from Europe to Western Asia, and from North Africa to the Canary Islands. 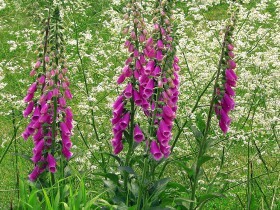 Digitalis poisonous, they should not be planted there, where small children play. 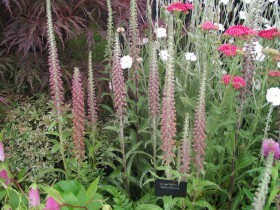 Digitalis frost- and drought-resistant, in addition to "southern" species. Grows well in Sunny areas, but tolerates partial shade. Prefers fertile, loose, permeable soil, in a stagnant place may not bloom. Plant care is weeding and loosening soil, watering during drought. 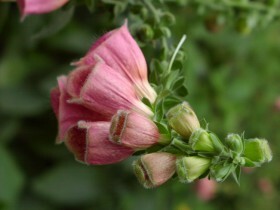 For the season the Foxglove can be one or two times to feed the complex mineral fertilizers. In autumn conduct soil mulching with sawdust. At the end of the summer need to follow the state of the root system – it can strip. With the arrival of the first cold sprinkle it with soil. "Wild" planting digitalis easily propagated by self-seeding. The most famous variety available. Settled in Eurasia, the flower grows well and develops in the middle lane. The plant is herbaceous, biennial: in the first year forms a rosette of basal leaves, on the second year shoots. The foliage is velvety, top – dark green, hairy, the lower part – grayish. The flowers are large, collected in the brush, main color – purple, spots inside the Corolla – dark red with white border. The fruit is a capsule with small seeds, blooms in June and July, the seeds ripen in August. Digitalis purpurea in the garden. 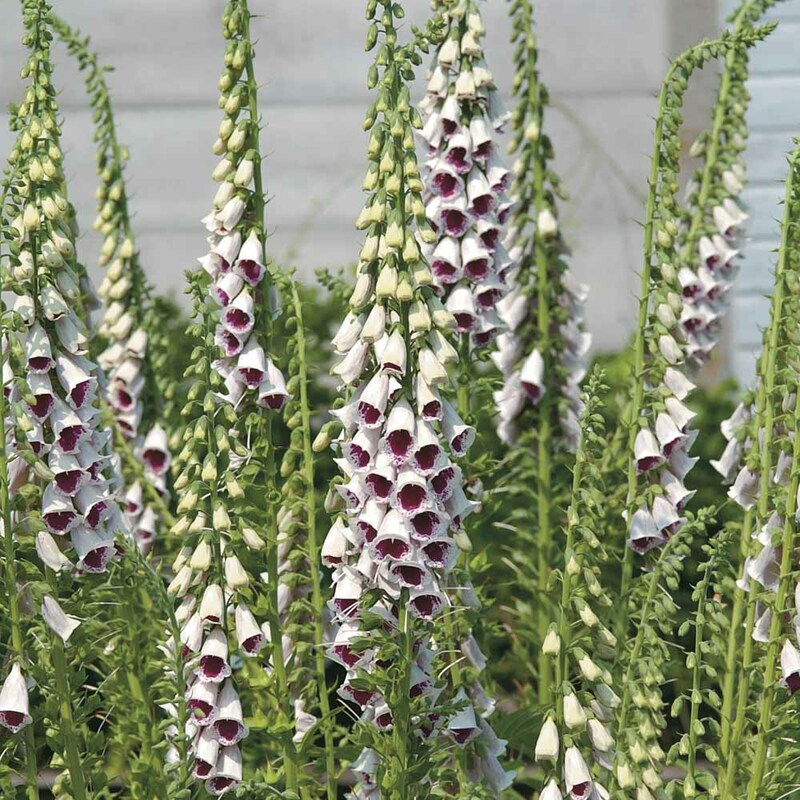 There are a few other names digitalis purpurea, even more artistic: English – "the glove forest fairies" or a "witch's glove", "Fox glove", other – "bloody fingers", "forest bell", "romatnic". The plant is widely used for medical purposes, drugs effective in all degrees of heart failure, tachycardia, atrial fibrillation. "Foxy" – low annual, blooms in the first year, if planted seedlings, flowers – white to pink with a contrasting "necks". The species has pubescent flowers with a pale yellow color, inside brown spots. Up to 120 cm, perennial, gives the flower stalks in the second year, sometimes behaves, as a biennial plant. Biennial plant, in the wild it grows in Spain and Portugal. 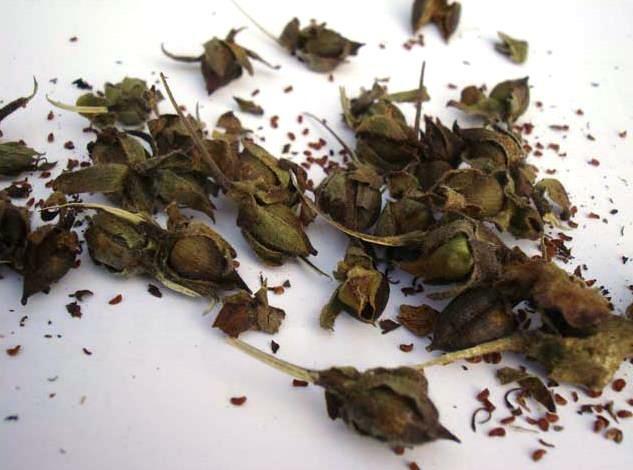 Flowers – funnel-shaped, chocolate. The plant looks like a large-flowered varieties, but a bit smaller bushes do not exceed one meter. Perennial, tolerates frost, great for garden, located in the Northern latitudes. Interesting shape of the flower makes this kind of like an Orchid. In the wild growing in Turkey and in the South of Europe. "Rusty" color, from yellow to light brown, good decoration tiered flowerbeds, to create artificial "thickets" on the site. Hybrid, flowers resemble strawberry, height – to 75 cm. Popular variety "summer king". Orchid plant, flowers – white, spot, spots – red, height – to 1,5 m.
The top layer for planting dug to a depth of 30 cm. To make the soil manure or compost based: 4 kg per square meter. You can add one or two cups of wood ash, nitrophosphate. The top layer is spread with a rake, fertilizers should be at a depth of 10 cm, the soil is compacted. Sowing the seeds produced in may, seedlings are prepared in early spring, in March. Seeds are harvested in the autumn, when fully ripe. Best choice – boxes with the largest stems, located in the lower parts of the plant. It is important to choose the moment, when the fruit is ripe, was painted a brown shade, but not yet burst. Harvested planting material gently sprinkle in the shadows, on a sheet of paper, remove debris. Seeds are sown in the spring. Experienced gardeners recommend pre-soaking in a little water. Another solution – coating landings film. The soil should be easy, holes and grooves to dig is not required, enough to cover the seed with peat or soil. 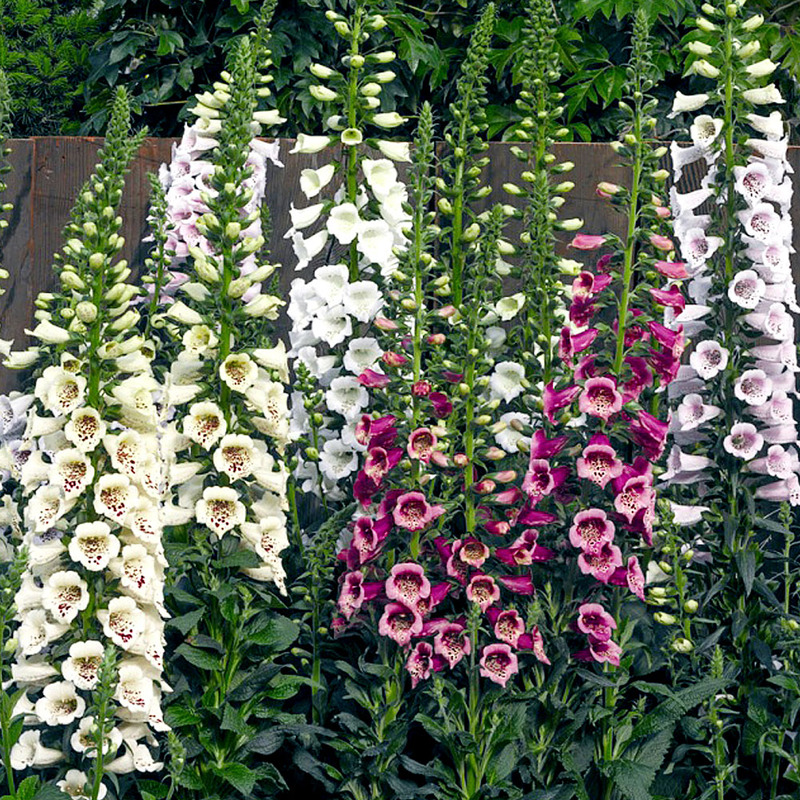 Thinned seedlings, planted Foxglove should feel free, distance between plants – two feet. The seeds are left on the most developed and large stalks, brush with other instances of cut and waiting about three weeks. During this time near the base grows a few small basal rosettes, they form seven or eight leaves. At this point the socket with the leaves separated from the main plant and planted in the soil at the site. When watering, care should be taken, in the middle is not exposed to water, and it is not clogged with soil. To survive the winter young plants will help the shelter out of twigs or fallen leaves. Decorative plants allows to widely use it in mixed borders, for planting under trees, to decorate the walls. 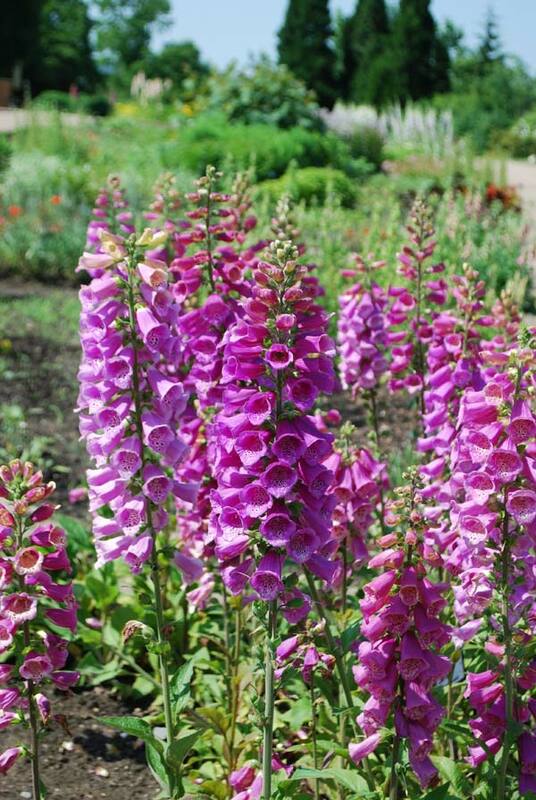 Digitalis is a good background for flower beds. Perfect partners – Kalina, mock orange, rhododendron, rose, honeysuckle, other trees and shrubs. In the shadow digitalis neighbours and gets on with hosts, geraniums, high primroses, akvilegiya. In partial shade – Valerian, decorative bow, peonies, astrantia. 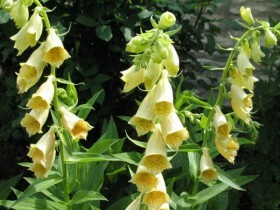 Digitalis can be used, as a pot culture for distillation. To do this in late August or early September the plant is transferred to a cold room with a temperature +12. In such conditions it begins to bloom in April. Flowers of digitalis in a good vase life, they are long standing in the water, being a wonderful material for bouquets. Large stalks are good in high ceramic or glass vases. Naparstek may appear spotting, control measures – use of copper-containing fungicidal drugs. Incurable root rot, in this case, the plant is removed. Digitalis affected by this and downy mildew, several species of moths and aphids, viruses and nematodes. For treatment using drugs, sold in specialty stores. All content on this site SamDizajner.ru written specifically for Simdesigner, copying 1 in 1 strictly prohibited. 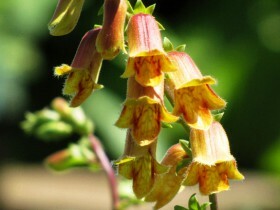 Reprint, full or partial rewriting of the article “Foxglove – plant-honey”, possible, only when you specify the full, active link to the source.